Dorchester County, part of Maryland's Eastern Shore, is located on the Chesapeake Bay. The population of the county is 32,618, with 38% of that from the city of Cambridge, the county seat. The Dorchester County courthouse is located in Cambridge. Major towns in this county include East New Market, Hurlock, and Vienna. The population is predominantly white (67.6%) and black (27.7%). Only 7% of the population is younger (18-24), with most probable members of the jury pool being between the ages of 45 to 64 (25.5% of the population). Median household income is about $34,000. Dorchester General Hospital, located in Cambridge and now part of the University of Maryland Medical System, has 38 beds and provides emergency and surgical services to Dorchester, Caroline and Talbot counties. As is typical of the smaller counties, in 2014 Dorchester County had only 11 automobile accident cases filed. That is not a lot of cases. Many plaintiff's lawyers complaint that this venue is less "plaintiff-friendly" than other counties. However, this jurisdiction has had some good jury verdicts where the damages warranted it. In one 2011 case (admittedly, a breach of contract case), the plaintiff received a jury verdict of $1,065,000.00. In March 2012, automobile accident case, a Dorchester jury ruled for the plaintiff for $655,858.00. None of this is to suggest that Cambrige juries are not conservative with their verdicts. They are. But you will get a fair jury and if you have a serious injury case, you should be treated fairly in most cases. There are only two judges in Dorchester County. The Circuit Court is run by administrative judge Brett W. Wilson, and John L. Norton, III is in charge of the District Court. 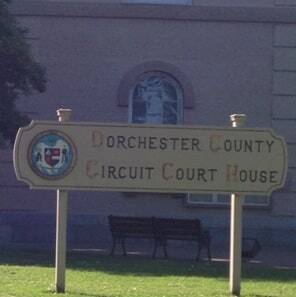 Circuit Court trial dates stick in Dorchester County. Once the date is set, it is extraordinarily tough to get them changed, which is usually a factor that favors plaintiffs (we try to get to the trial, the insurance companies and defense lawyers want to stall the case). If you have a serious automobile accident, medical malpractice or other personal injury case in Cambridge or elsewhere in Dorchester County, contact our personal injury lawyers at 800-553-8082 or click here for a free consultation.